Guru Poornima 2008 was celebrated in the remote village of Kailasagiri, a serene tribal hamlet in Andhra Pradesh, 85 km north of Chennai. This was the first time that the karma yogis of Satyam Yoga Trust were independently working on a celebration of such a large scale. Close to 50 karma yogis assigned to 15 different committees were working incessantly for weeks together preparing for this celebration. The day started with Purnakumbam honour to our beloved Guruji Sanyasi Krishna Yogam. It was a blissful sight to behold our Guruji, Mataji and the blessed mother of our Guruji, welcomed into the venue to the accompaniment of powerful and soul-stirring vedic chants by the pandits and fellow disciples. Soon, the swarm of 250+ disciples and some 150 local villagers were neatly seated in the pandal facing the Homa Kundam and the stage. The program started with Ganapati Homam, followed by consecration of the statue of our Param Pujya Gurudev, Swami Sivananda Saraswati. Following that was the Guru Paduka puja to the accompaniment of chantings of the stotras Bhavasagara, Guru Paadukaabhyam, Guru Stotra etc. by the kirtan mandali. 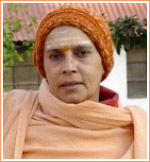 Going with the direction shown by Swami Satyananda and Swami Niranjan in Rikhia, it was decided that any celebration will first involve helping our neighbours. The survey committee went to every village surrounding Kailasagiri, met the village heads along with all the residents and diligently identified the 108 most backward families. As a humble beginning to serve these neighbours, it was decided to give them a kit consisting of 2 blankets, 1 dhoti, 1 saree, 1 towel, 5 kg rice and 2 kg dal, at a cost of Rs 650.00. Guruji in his satsang brought out the significance of Guru Purnima Day for a spiritual aspirant. Guruji outlined his grand vision for an ashram premise that will provide an ideal environment for fellow sadhaks to help one another in their spiritual discovery, a 'goshala', a Yoga and Naturopathy hospital, a yoga school for children, an orphanage, a old age home and so on. It was with this vision that Satyam Yoga Trust was formed 2 years ago and everything outlined in the legal papers of the trust is becoming a reality because of the sankalpa of Paramahamsaji. The afternoon programme started off with video clippings of satsangs by our Guru Parampara. Watching these clippings was like drinking nectar and must certainly have opened up our minds to the concept of Guru-Disciple relationship. All of those who paid attention to the loving, simple, straight, powerful speech of Swami Sivananda would have felt the supreme infinite power inside every one of us. He exhorts every one to "Give Charity; Don't advertise. Give, Give, Give. Let that be the dharma of your life". Whoever listened to Swami Satyananda's loving description of Shakti, his mother with beautiful eyes, would have felt the presence of Devi. We learnt that a disciple should identify himself with the Guru Tattwa and not the physical form of his Guru. Listening to Swami Niranjanananda’s clippings on Milarepa, it became clear that the only thing a disciple needs to offer to his Guru is complete surrender of his ego. No amount of sadhana or penance or sacrifices will help in salvation unless one gets rid of the ego principle. Any description of Guru Purnima 2008 celebrations at Kailasagiri will be incomplete without sharing with you all the bliss of bliss, the photo gallery, so painstakingly put together by Jignasu Brahmananda. Rare photos of Swami Sivananda meditating on tiger skin in the banks of the Holy Ganges, Swami Sivananda playing multiple musical instruments such as violin, veena, flute etc., Swami Sivananda performing his favourite hatha yoga asanas and practising kriya yoga, Swami Sivananda as a qualified medical doctor attending to various sick and ailing people including children and swamijis, Swami Sivananda working in his research lab on medicines, young Swami Satyananda, Swami Chidananda, Swami Krishnananda and other stalwart disciples of Swami Sivananda with him etc. Rare photos of Swami Satyananda while performing Panchagni Sadhana, Swami Satyananda initiating Swami Niranjan into tantric tradition and transferring his spiritual power to Swami Niranjanananda, young Swami Niranjanananda of 7 years traveling in a train seated behind Swami Satyananda and so on. Above all, the beautiful picture of the holy feet of Swami Sivananda with fresh and bright flower petals mesmerisingly strewn around. We want to retain this image for ever in our mental space and heart space, and surrendering our mind, intellect and ego at the feet of our Guru, become one with the supreme brahman. May He bless us with the twin fruits of Viveka (discrimination) and Vairagya (non-attachment or dispassion). It was inspiring when Guruji Sanyasi Krishna Yogam said that SYC Mambalam has proven that without a place of our own and without charging any money it was possible to spread Guru's mission to over 7000 people in the last 7 years. Now, it is the wish of our Parampujya Gurudevs that we establish our own ashram and transform it into the epicentre of Satyananda Yoga in South India. We took a sankalpa that we will take the message of our Gurus - spread yoga door to door and serve thy neighbours - to every village of all the southern states. As we got ready to board the bus, the full moon opened itself in the sky from behind the perfect contours of the Kailasagiri. It was clear that the Gurus were showering their grace in full and will guide us with love and affection through the rest of our journey towards self-realization and spreading their mission. Jai ho!